Make sure that your product or service is front of mind with experts in mental health using this psychologist email database, which has the key contact information necessary to form direct B2B connections with professionals in the world of psychoanalysis. Psychologists have very important jobs: They're on the front lines of helping people cope with mental illnesses and improve their lives every day. But due to the nature of their field, privacy is of the utmost importance, which means that they aren't always the easiest professionals to reach. 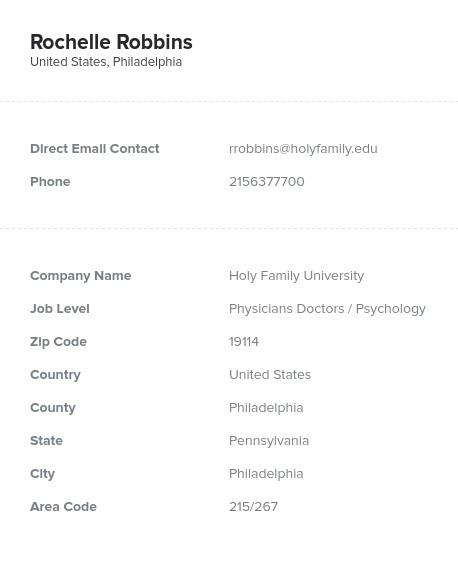 Here at Bookyourdata.com, though, we've solved that problem with this psychologist mailing list, which contains all of the accurate, human-verified information you need to reach out to them and make important connections. Find sales leads here and you'll get the real names, phone numbers, mailing addresses, email addresses, and fax numbers of psychologists and psychoanalysts across the country in an easy-to-use .CSV file. You can get started building ties in this field right away once you integrate this psychologist email list into your CRM software, or you can try a more targeted approach using our custom list-builder tool, which lets you create your own business email list of, say, just psychoanalysts in San Francisco or Sarasota. If you have a product or service that can help these health professionals to help others, let them know using our psychologist email database and you're sure to feel great about the results. Download it today and see for yourself!